Zehra Özkaymaz, who is known as Zeruj on social media, poses during the opening on May 11. It can be argued that the fashion industry today - as a sector that was dominated initially by white supremacy, like almost every other sector in the world - has reached its most inclusive phase in its history. Once, the industry only addressed white, upper-class males and females who fit into societal norms perfectly. Yet nowadays, many parts of society who were excluded or overlooked for many years, can find a place for themselves in the fashion world. There are dozens of plus-size fashion lines, black fashion designers at the highest ranks of the most famous brands and of course, modest fashion is one of the latest and most precious productions of the fashion industry. While many international brands started to launch their own modest fashion lines, including H&M and Dolce & Gabbana, Turkey has introduced a new aspect to the concept by launching the world's first conservative, women-specific mall. Zeruj Port brings together modest fashion brands, and not just top brands that have been dominating the sector for years. The shopping center addresses women of all ages. The stores at the mall consist mostly of popular Instagram brands, which address the younger audience with their styles that bring a modern and fresh look. The majority of these shops are the first actual stores that these social media brands have opened. For an average customer like me, it is not only convenient to be able to see what I liked on social media but also it is inspiring that so many women who were mostly either housewives or students at first, became so successful that they now have their own boutiques. More credit should also be given to the mall for its wide variety in the clothing spectrum. Although I believe it could be better, for a newly launched mall, it was good to see that there are several selections that are offered to the customers from more casual lines to dressier lines. Thankfully, Zeruj Port does not only consist of fashion brands but also stores that sell household items or products that are specific for children. Actually, as a covered woman myself, I think that this is a really creative and even beneficial concept that has lots of potential. In my opinion, for a long time there was an invisible demand in society for such a place. This could easily be observed from the popularity of the modest fashion brands that emerged on the social media platforms like Instagram. Yet, there is also a downside to the mall, which is the fact that it also falls into the trap of over-pricing. For many years, the fashion industry overlooked the demand for modest fashion wear and offered almost nothing to customers, even in countries like Turkey where the majority of the population is Muslim and half of the women wear headscarves. A few years ago when modern modest fashion brands started to emerge, they saw the potential in the market and tried established their own monopoly with highly over-priced items. Naturally, these brands addressed only the upper crust of the society. Yet, although it is usually expected for the industries that as the market grows, many alternatives with lower prices would also emerge and can address the whole society, the modest fashion industry surprised all of us by lacking in the number of alternatives despite the greatness of its size. There is certainly a more moderately priced modest fashion market but, it is growing really slowly. The real problem is that places like Zeruj Port, which is located in a very moderate neighborhood in Zeytinburnu, Istanbul, don't support more reasonable alternatives. Instead they provide overwhelming support to the ones that only serve certain people in a certain financial situation, leaving the others outside and causing one of the biggest problems in the modest fashion industry. One thing should be mentioned as well: Although the mall garnered a lot of attention thanks to its emphasis on "women-only" aspect, I believe it was actually false advertisement and misleading people. When you say a mall is for the women only, one can easily assume that it is open only for the women, meaning that no men are allowed, which could have easily been demanded by some women who embrace modest clothing and yet could also be very problematic in terms of a feminist point of view. When it comes to Zeruj Port, we don't have to discuss any of these since the mall actually is welcoming for the male customers. 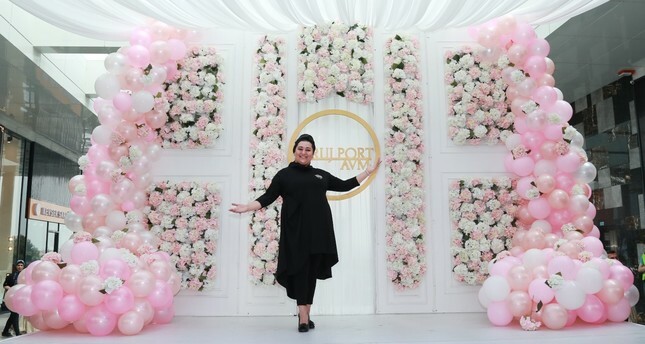 As a matter of fact, despite being opened by a women, Zehra Özkaymaz, and consisting mostly of brands that are owned by women, even at the opening ceremony of the mall, there was only one woman that can be seen in the photos which is quite interesting for a mall that claims to be specific to women. In fact, Zeruj Port brings together many modest fashion brands in an open-air mall which anyone who wishes, including men, can visit and shop at. The best next thing in the mall is actually a restaurant, which stands out with its taste, quality and reasonable pricing. With aims to become a "modern artisanal restaurant," the owner of the restaurant Siret Albayrak said, his restaurant is already quite ambitious in the food sector although it opened only eight months ago. "We already have a certain customer mass," said Albayrak while emphasizing that they wish to be one of the cult restaurants in Istanbul. All the ingredients of their meals are organic and come from different parts of Turkey. Even the chefs of the restaurant are all from the Mengen district of Turkey's Bolu province, which is famous for its chefs and their delicious food. "We are open to change and try to improve ourselves every day in accordance with our customers' suggestions," Albayrak further underlined while highlighting that they aim to address the whole of society by keeping their prices at a reasonable level, unlike many other stores in the mall.